Developed by Virginie Uhlmann and Ricard Delgado-Gonzalo at the Biomedical Imaging Group (BIG), EPFL, Switzerland, and Pavan Ramdya at the Center for Integrative Genomics, University of Lausanne, Switzerland. 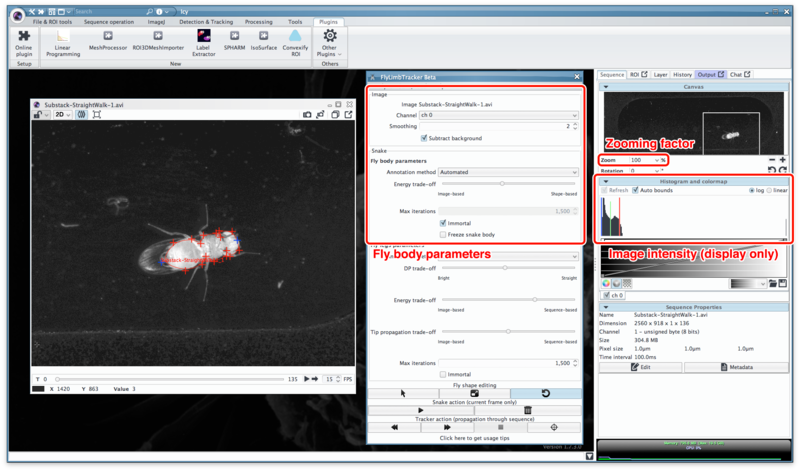 Here we describe FlyLimbTracker, a method that uses active contours to semi-automatically track body and leg segments from video image sequences of unmarked, freely behaving Drosophila. This approach can be used to measure leg segment motions during a variety of locomotor and grooming behaviors. The software implementation of this method is designed as an open-source plug-in for icy. V. Uhlmann, P. Ramdya, R. Delgado-Gonzalo, R. Benton, M. Unser, FlyLimbTracker: An Active Contour Based Approach for Leg Segment Tracking in Unmarked, Freely Behaving Drosophila," PLoS ONE, vol. 12, no. 4, pp. 1-21, April 28, 2017. FlyLimbTracker will soon be downloadable directly from the icy online plug-in repository. Meanwhile, in order to install FlyLimbTracker, one should follow the below procedure. Download the icy (version 1.7.3.0) with flylimbtracker zipped archive. Unzip it and start icy by double clicking on the icy executable in the icy folder. In icy, go to the Plugins tab, click on Other Plugins and, in the list, move the mouse to big and then to flylimbtracker. Finally, click on FlyLimbTracker (see Figure 1). Because of virtual memory requirements, we recommend using FlyLimbTracker on a desktop computer if possible. Mac users: the icy executable might not launch the first time when double-clicking, and you might get an error message indicating that the program cannot be started for safety reasons because it is from an unidentified developer. To fix this and start icy, open System Preferences and go to Security and Privacy, click on the lock on the bottom left of the window (you will be prompted for your password), and change the allow apps downloaded from: from Mac App Store to Anywhere. A warning popup will appear, click Allow From Anywhere. Then, icy can be launched again and should open without problem. Figure 1. Icy plug-in menu with FlyLimbTracker. The FlyLimbTracker video user manual can be found here (.mov format, 248 MB). The video user manual aims at providing a hands-on example on how to use FlyLimbTracker. Along with the video, we strongly encourage users to read the description of the various elements of the user interface provided in the Appendix section of the FlyLimbTracker manuscript. Upon launch of the plug-in, you should have an image data sequence ready. Select bioformat importer to begin. The sequence with the FlyLimbTracker menu will appear, fix the dynamic range and zooming if necessary. Adjust the parameters in the menu and start analyzing data. The parameters can be updated at any time. Figure 2. Main parameters to be adjusted upon plug-in start and fly body initialization. Figure 3. Main parameters to be adjusted upon fly leg initialization and tracking. Important tip: like every software, FlyLimbTracker is not 100% guaranteed to be bug-free and, although it has been extensively tested, might freeze or crash unexpectedly. In order to minimize the risk of loosing hours of work, FlyLimbTracker's menu has been designed to run as independently as possible from all interactive actions (clicks, tracking, etc.) on the image. In case of crash/error/freezing, or more generally in case of bug preventing any further modification on the image sequence, it is strongly recommended to try to save annotations via the Save/Load menu, which shall remain responsive and properly record data in the vast majority of error cases. After saving, icy can safely be force-quitted and annotation reloaded again via the Save/Load menu. We provide here a sequence of raw data in order to test the software, as well as the annotation procedure and results going along with it. The Matlab script used to load the annotations and generate the visualizations of output data as shown in Figures 3 and 4 in the FlyLimbTracker manuscript. In order to adapt the parameters for the annotation of the test sequence, we orient the user to the User Manual section and to the video demonstrating the full annotation process listed directly above. We provide here the videos presented and discussed in the manuscript. They have been cropped and compressed to enhance visualisation. We do not recommend to use them for annotation purpose because of compression artifacts.